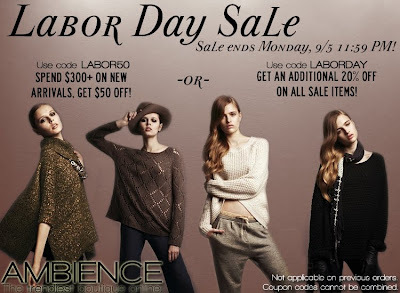 A Labor Day Sale to remember! Your choice of the promo! Save $50 when you spend $300 or more on new arrivals, with coupon code LABOR50. Get an additional 20% off on all sale items storewide with coupon code LABORDAY. So many choices, such little time! Sale ends Monday at 11:59 PM, so you'd better act fast! !